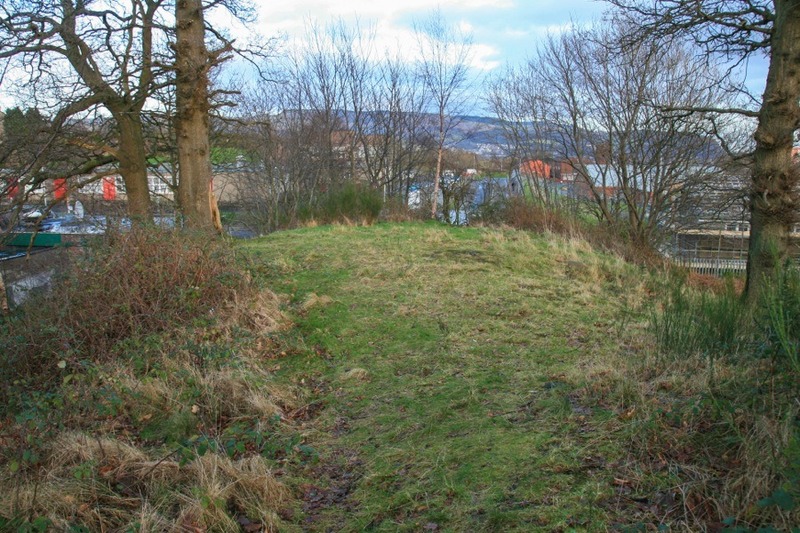 A substantial mound at the north-east corner of the Cunninghame Graham Memorial Park is said to be the site of Robert the Bruce’s castle at Cardross, although no trace of any building remains. 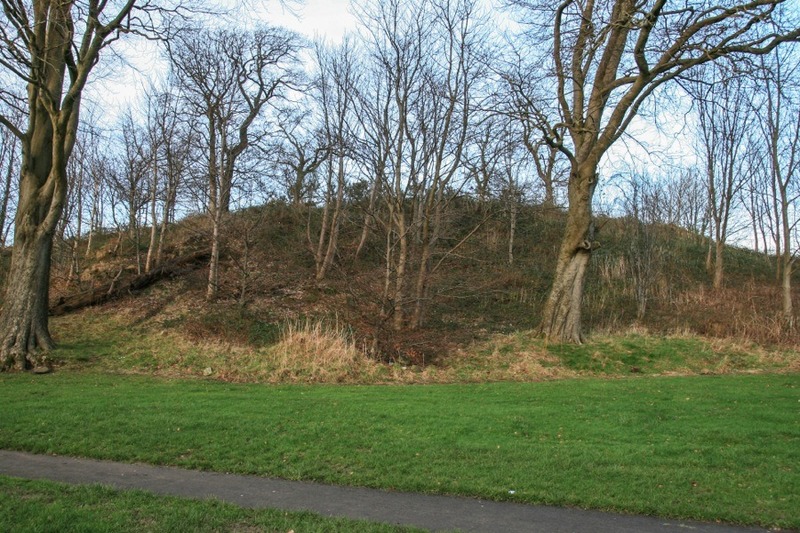 The mound is a rocky outcrop and is steep on the west and south sides while being most approachable from the east side. Some rocks poke through the slope on the east side, and a few of them almost have the look of dressed stones. The main top is quite flat and measures around 25m east to west by around 8m north to south. To the south there is a slightly lower terrace. This is the supposed site of a house built by Robert the Bruce around 1326, although the consensus now seems to be that this is not the case. In 1321 Malcolm, the 5th Earl of Lennox, gave his lands in Cardross to Robert the Bruce in exchange for half the lands of Leckie. The following year Adam, the son of Alan, also gave the king land in the barony of Cardross and received in compensation the lands of Hoyden or Moyden in Ayrshire. Then in 1325 Sir David Graham, son of Sir Patrick Graham of Dundaff, gave the king the lands of Succoth and Moyden which bordered the River Leven in the barony of Cardross in exchange for lands in Angus which were erected into the barony of Old Montrose. Probably in 1326 Bruce began building his house, which was not described as a castle or palace but as a “manerium” or “manororium”, probably a manor house. The house is described as being single storey and having a hall, queen’s chamber, chapel, kitchen and larder as well as an apartment for the king. It had a thatched roof and isn’t though to have been fortified, although this seems unlikely for a king’s house in the turbulent times of the 14th century. 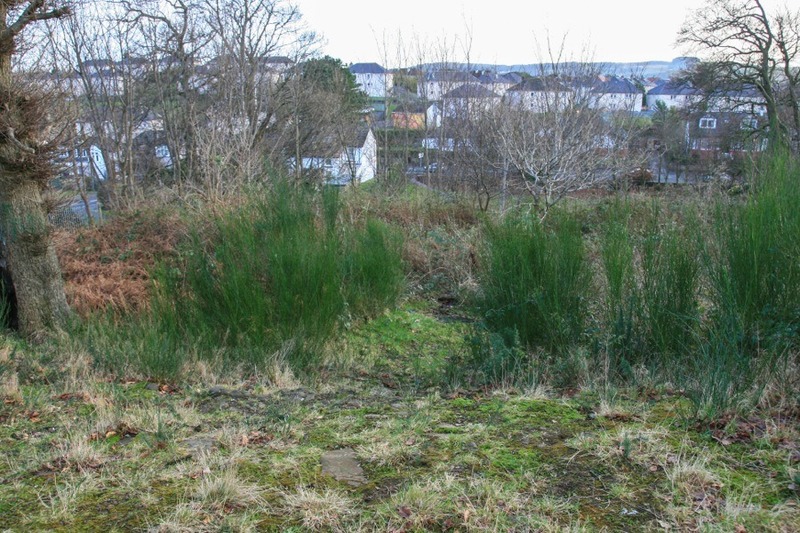 The house also had a garden and a hunting park which became known as the King’s Park of Cardross. Robert the Bruce died at his house on the 7th of June 1329 of what is thought to have been leprosy. It was believed for a long time that the site of Bruce’s house was on Castlehill, although this doesn’t appear to be based much on fact. Records show that Bruce kept boats or ships near his house, which perhaps suggests a site closer to the River Leven than Castlehill. Dalmoak Farm, Mains of Cardross Farm and Pillanflatt have all been suggested as alternative sites. Even if Castlehill wasn’t the site of Bruce’s house it may still have had a castle upon it at some time in history. 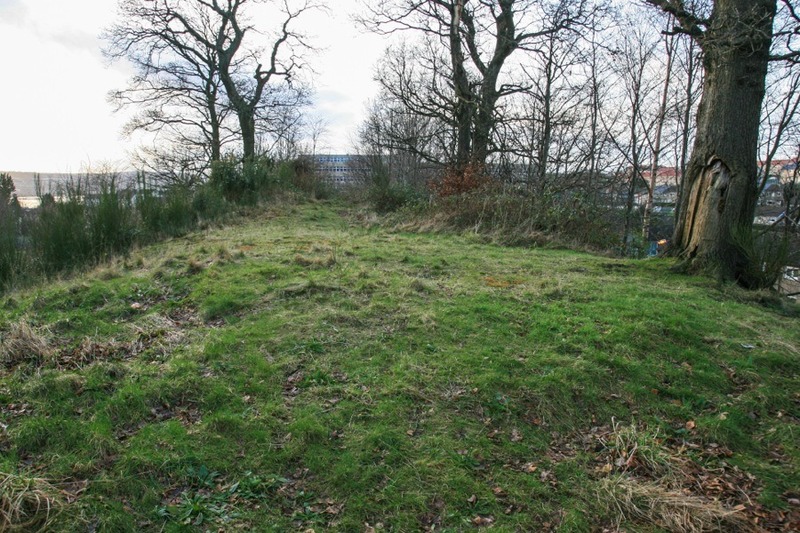 The site certainly has the look of a motte (it’s reminiscent of the Gillespie Moat motte in Biggar amongst others) and it may be that this was the site of an early castle belonging to the Graham family. 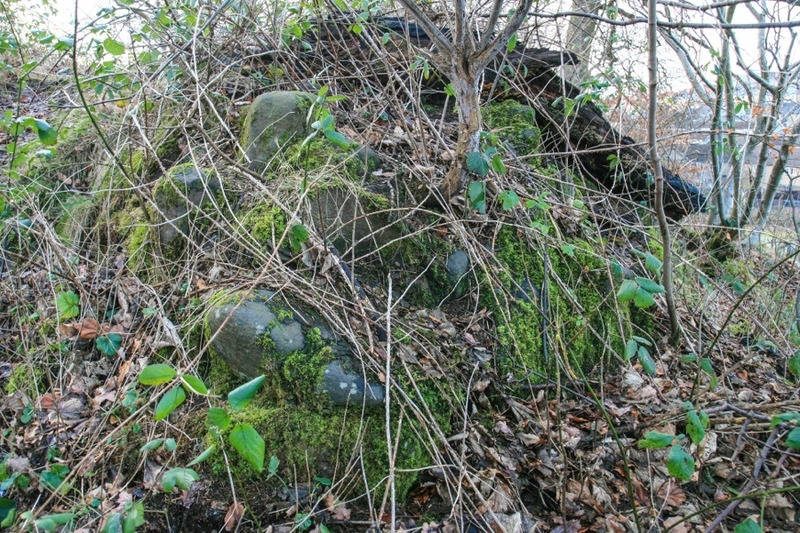 Stones from Cardross Castle are said to have been used in the construction of parts of Dumbarton Castle in 1570 when John Fleming, the 5th Lord Fleming, the Governor of the castle at the time, refortified in support of Mary Queen of Scots. Whether that was a castle on Castlehill or somewhere else in Cardross is unclear. 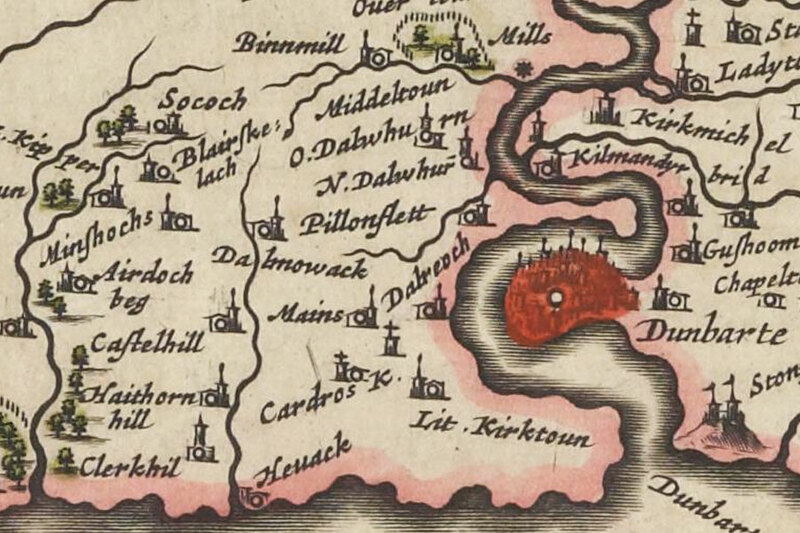 On Blaeu’s map of 1654, based in part on an earlier map by Timothy Pont, Castlehill is shown with a symbol used to indicate neighbouring castles, although it could also be interpreted as some kind of settlement. Just to the east of Castlehill were the buildings of Castlehill Farm, which existed until the mid-20th century when the area was developed for housing. Castlehill was latterly owned by the politician Robert Bontine Cunninghame Graham whose family estate was across the Clyde at Finlaystone. Cunninghame Graham died in 1937 and left Castlehill to the National Trust for Scotland who continue to manage what is now known as the Cunninghame Graham Memorial Park, or “the Mony” after the monument which once stood there (but has now been moved to Gartmore). Cardross Castle is in the parish of Cardross and the county of Dunbartonshire. Published on the 3rd of April 2012 at 10:01 pm. Updated on the 25th of May 2014 at 4:02 pm.